Wow your guests with these black and white vintage-styled chalkboard table numbers. 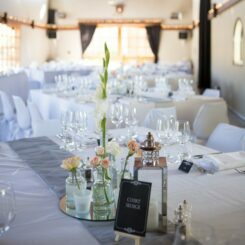 They will add a gorgeous touch to your wedding reception. With a stunning chalkboard background, the beautiful calligraphy font is a contrasting crisp white and is easy to read. Each of your table names are then framed by a lovely white border with vintage ornaments at the top and the bottom. Once you submit your order, you’ll receive an email with an electronic form to submit your table names and revisions to the design required (including colour changes). You can find out more information about the design and order process here. Pictured here in the flat A6 style (105 x 148mm), they can also come in larger sizes and a folded piece which can stand on its own. They are printed onto the standard 300gsm white card. 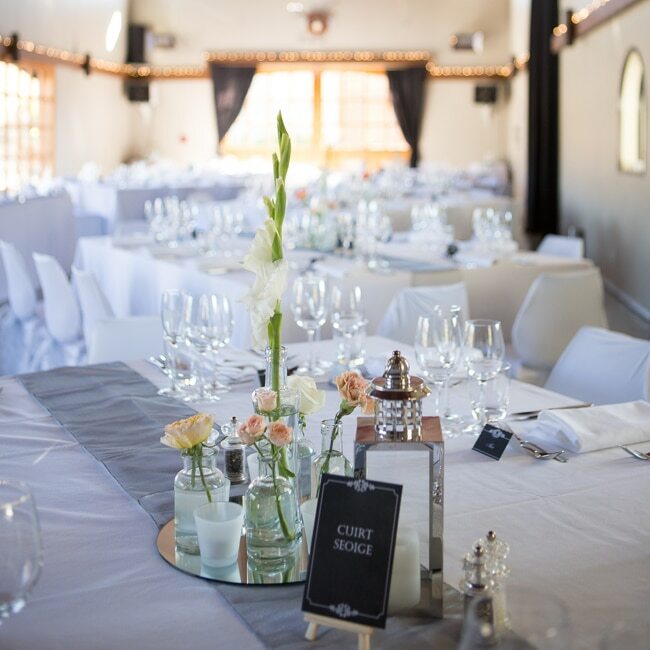 Mariska and Steven had their wedding at Mount Soho, and their chalkboard reception stationery suited the venue beautifully. Their table names were locations that were special to them. This A6 menu complements the Chalk it Up range of wedding invitations. This beautiful menu can be fully customised, and changed to any size. These table settings were finished off with a chalkboard style table number, resting on a wee wooden easel. Each table number highlighted a special year in this couple’s life. Love this idea! Some of the other years featured included their children’s births, the year they met, their births, and their parent’s marriages. Those incredible flowers were done by Carley Jones Floral Design. So elegant! Holly & Matt’s wedding photographer, Craig O’Neill, did a fantastic job documenting the day, and for more pictures please visit his website. Below is a picture of the table number in the folded format. This is a handy idea for when you need the table numbers to self-support. An electronic draft mockup of your table names before they go to print – so you can see how everything looks and request any changes. Up to two rounds of revisions are included. Amanda did these table numbers for us in the navy and gold to match our invites. The numbers look great on the tables. We also had three other signs done at the same time. Amanda’s service was fantastic and everything was well communicated and the end products stunning. Very happy.